A Successful Air Charter Mission. Another Significant ATN Milestone! All Transport Network (ATN) chartered a B747F from US flag carrier Evergreen International Airlines thru Air Charter Service HKG for the delivery of a plane load of 80,000 kilograms of military supplies for the Armed Forces of the Philippines (AFP). Majority of the materials were hazardous and dangerous goods in nature. The plane took off from Travis Air Force Base, Fairfield, California May 30 and safely landed at Clark Airport, PH early morning the next day June 1. This was seamlessly delivered end to end a la carte to the designated military depots by ATN. “Truly a great feat and a commendable achievement by ATN as we had been trying to get these supplies delivered since a couple of years ago. WE are truly grateful ATN made it possible! 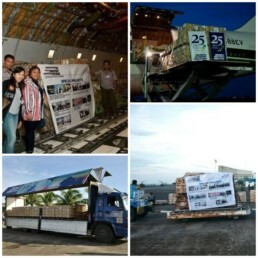 “, jointly emphasized by logistics officials from AFP and JUSMAG. True to its commitment to add value to its clients, ATN bagged its current and ongoing contract as the sole freight forwarder for the AFP’s US Foreign Military Sales (FMS) in Aug 2010. The majority of the materials handled and shipped under the FMS program are containerized and general cargo. Since 2003, ATN has successfully handled and implemented government contracts which are special projects in nature. About the same time last year, they chartered a 27,000 DWT RORO vessel from Hoegh Autoliner ex Baltimore port, USA docked and discharged 216 units of military trucks at Subic port. ATN management and its Special Projects team is truly honored with the privilege and opportunity to be a valuable partner to the Philippines’ military service units.